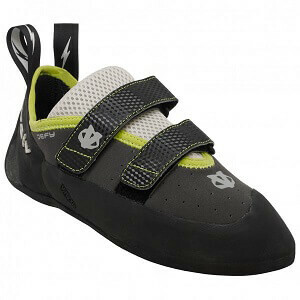 For indoors or rock climbing - the latest climbing shoes will let athletes find purchase on seemingly smooth surfaces. What's the trick? The soles are made of a special rubber mix that generates as much friction as possible on the rock. This feature is shared by all climbing shoes. There are, however, a few differences to look out for. Choosing climbing shoes or bouldering shoes is like a balancing act between optimized functionality (a very snug fitting shoe), and the necessary comfort (a less tight shoe) for longer climbs. Mark Twain said "If you want to forget about the worries of the world, you just have to wear a pair of shoes that is a size too small for you" - wearing a pair of brand new rock climbing shoes can be a very similar experience. But since climbing shoes do become looser over time, it does pay to buy them pretty tight - if not for comfort, then definitely for performance on the rock. This phenomenon applies mainly to leather shoes - synthetic leather will not loosen as much. In terms of fit, a climbing shoe should be pretty snug around the heel, and the big toe should touch the tip of the toe cap. Make sure the pull-on loops in the heel area are large enough for your fingers to help getting you into the shoe. In terms of shape and material - well every version has its advantages and drawbacks. The most important aspect is correct fit, followed by your own preferences. Climbing shoes for kids should be selected along the same criteria, but you should make certain that the foot of the child is not squeezed in too tightly. 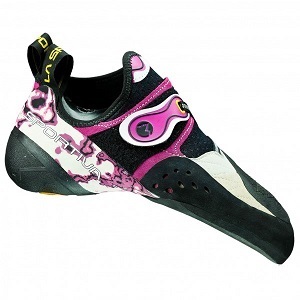 Specific climbing shoes for women hit the market relatively late, and were initially simply men's shoes with a different design. Over time, though, manufacturers have produced rock climbing shoes specifically for the female shape of the foot. For women with particularly petite feet, looking for bespoke women's climbing shoes will make sense, as their cut is narrower, and the shoe height at the heel is lower.